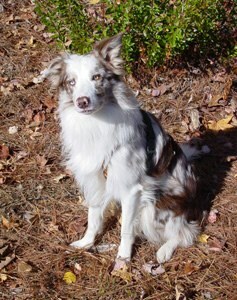 Charisma (or Riz as we call him) loves flyball and agility. He practices happily with me but when I am not there he harasses the teeter and weave poles and then mounts the A-Frame and looks in the kitchen window to see if he can draw me outside. He also is an accomplished soccer player. Last winter during the blizzard, I found him up in a tree he had been able to climb when the mounds of snow pulled the branches down. He simply walked up. He too likes going fishing but has no intention of going overboard. Instead, he herds the stringer of fish attached to the boat is is usually in my way if I try to troll. We are a bit of a circus on the lake. Oh well, I too am driven to play with my guys. 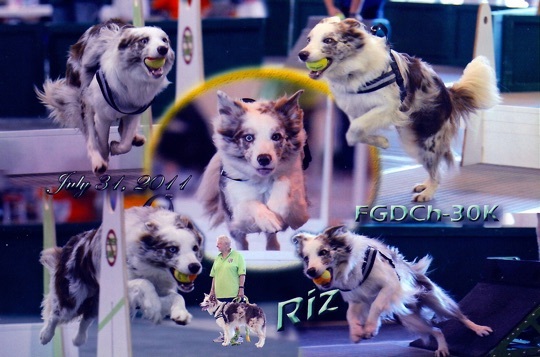 Riz has retired after 10 years of racing and plans include sleeping in and playing with puppies.